Cibachrome print, 37 x 26 in. 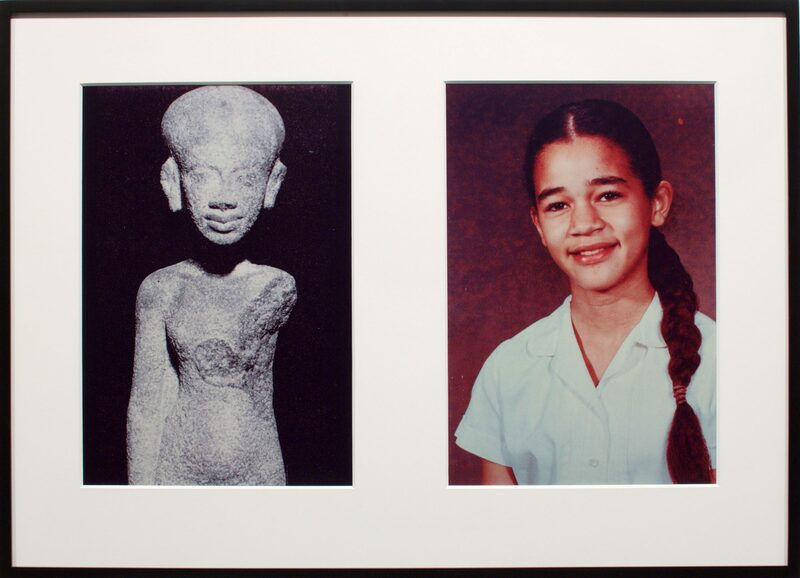 Lorraine O’Grady is known for work in performance, photo-installation, and photomontage concerning aspects of race, intersectional feminism and gender, and inclusion/exclusion. Born in Boston, her work is highly informed by her heritage as a Caribbean-African-American and her experiences as the child of middle class Jamaican immigrants. After graduating from Wellesley College in 1956 with a degree in economics and Spanish literature, O’Grady took a circuitous route to becoming an artist; she worked as an intelligence analyst for the U.S. government, a novelist and literary translator, and a rock music critic before turning to visual art in the 1970s. 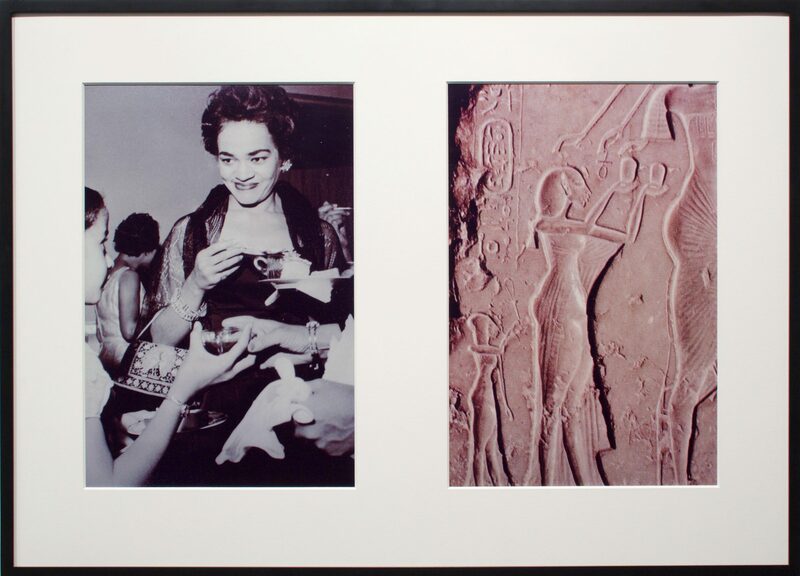 In the mid-1980s, O’Grady began to work primarily with photography and photo-collage, producing works largely concerned with the racial relations and the black female experience. In works such as the 1991 photomontage The Clearing: or Cortez and La Malinche, Thomas Jefferson and Sally Hemings, N. and Me and the 1994 series Miscegenated Family Album, she employs juxtaposition and integration to explore notions of hybridity and difference. As such, her work-both artistic and critical-seeks to articulate the complicated status of individual subjectivity and identity, with the intersections of race, gender, and class that this entails. 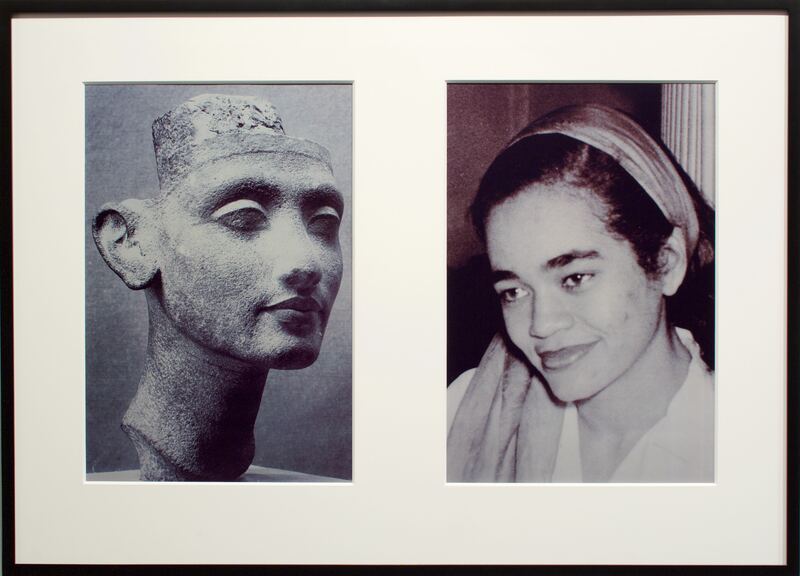 In her 1994 series Miscegenated Family Album, O’Grady produced sixteen photographic diptychs comparing the life and family of her older sister Devonia with that of the Egyptian queen Nefertiti. The slides represent O’Grady’s process of mourning for her estranged sister, who had died before the two could reconcile. 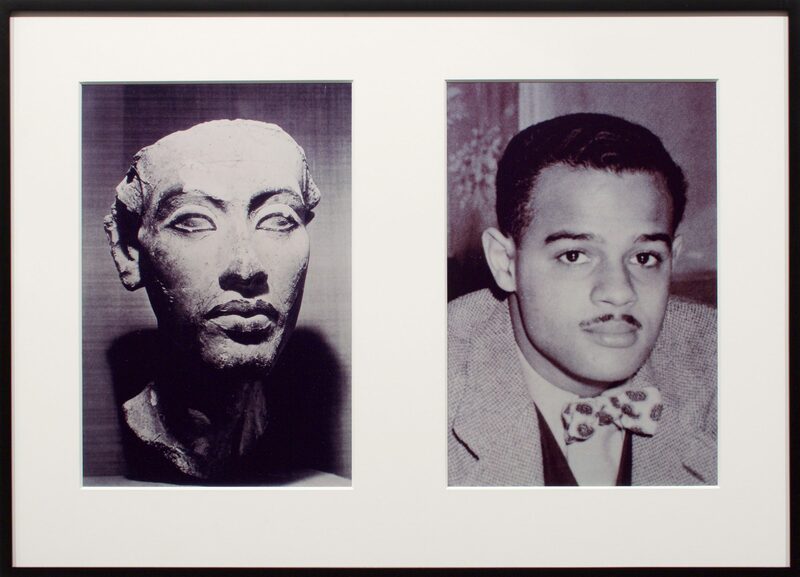 The diptychs draw similarities between Devonia and Nefertiti: their husbands and children, mixed-race backgrounds, and distanced relationships with their sisters. The series probes these tensions in order to suggest the ambiguity and complications of belonging, situating O’Grady’s family in a wider history of racial and gendered relations. Thus, the work is an elegiac memorial to loss and the endurance of memory, both personal and collective. In the intimacy of these portraits, we become witnesses to a poignant autobiographical narrative playing out over time.